You are currently browsing the archive for the advertising category. Where does public radio rock—or even rule? And why? (Note: Totals above are of noncommercial stations with typical public radio formats: NPR-type news and programming, plus classical, jazz and alternative music. I didn’t include noncommercial religious stations†). Of course I’m pleased to find my town, Santa Barbara, on top. Here’s how Nielsen breaks out station ratings within that 23.4 share number. KCLU-AM 2.6. This signal has the same audio as KCLU-FM, so the two together are 9.4, which makes KCLU #1, edging KTYD, the landmark local rock station, which gets a 9.2. KUSC 5.2. Though reported as KUSC, this is actually KDB/93.7, which carries the audio of KUSC from Los Angeles. KCRW 3.9. This is surely KDRW, which mostly identifies as KCRW, since most of the time KDRW carries the audio of KCRW, from Santa Monica/Los Angeles. KDRW 1.3. This is a case of one station reported two different ways. Together they total 5.2. KCBX 1.3. This is KSBX, a 50-watt repeater of KCBX from San Luis Obispo, which has no signal at all in town (being blocked by the 4000-foot Santa Ynez Mountain range). KPCC 1.3. This is the 10-watt translator of KPCC from Pasadena/Los Angeles. KPCC’s home signal doesn’t reach here. Demographics. 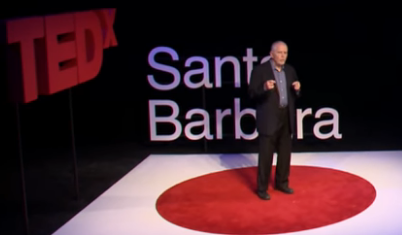 Santa Barbara is an upscale university town with a bonus population of active older folks who are intellectually and culturally engaged. NPR, for example, tends to do well with that combination of crowds. Lots of signals. There is now a surfeit of public radio signals in Santa Barbara.The list above is unusually large for a town this size, and doesn’t include stations that serve the market but didn’t make the ratings, such as KPFK (Los Angeles most powerful FM station, which also has a local 10-watt translator) and UCSB’s college radio station, KZSB). Geographic isolation. 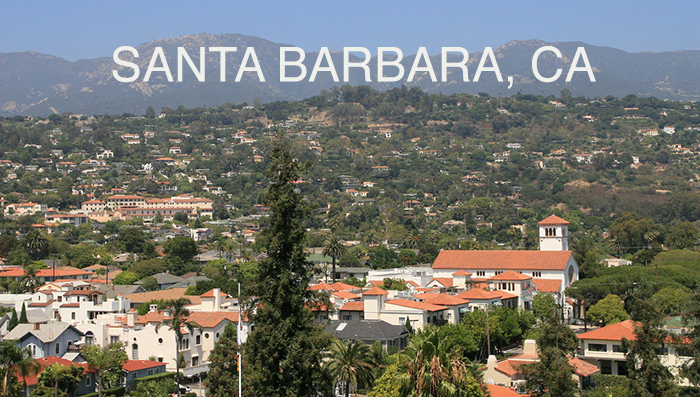 Santa Barbara is far enough from big market signals to make them weak or absent. (Some do get in, and even show a bit in the ratings.) I think the same kind of thing can also be said for many of the other smaller markets where public radio does well. Disasters. Santa Barbara has a long and almost steady record of wildfires, the largest of which was the Thomas Fire in December 2017, followed by massive debris flows during a storm in January 2018. Public Radio and other local media became indispensable during that time. I suspect it has stayed that way in a time when national news has become more partisan and less anchored to facts “on the ground,” as they say. 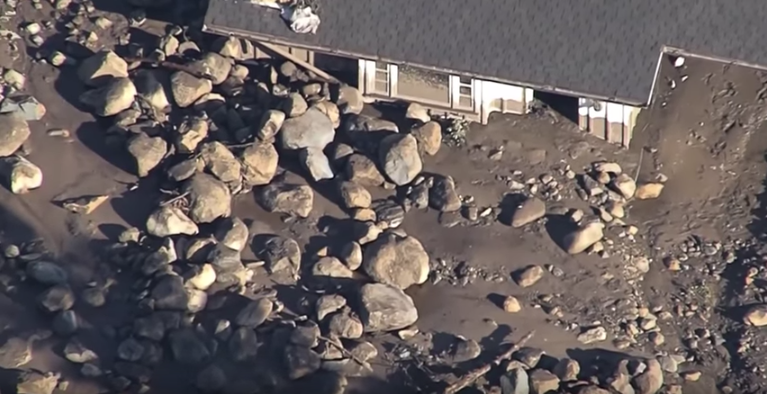 Montecito debris flow, January 2018. From KEYT/3. Public radio may be the only part of shared culture, other than sports, where the media center still holds. This too owes to being anchored in local culture, and reporting on local news, which by necessity tends to be less partisan than national news has become. Listener abandonment of over-the-air radio, especially for music. Music and talk listening has been shifting for years from over-the-air to streaming services, satellite radio and podcasts, leaving public radio with a higher percentage of listening to over-the-air broadcasts. Embrasure of streaming, satellite radio, podcasting, smart speakers and other new technologies. Public broadcasting has long been ahead of the technical curve, and in the last decade has done an excellent job of maximizing what can still be done with legacy over-the-air broadcasting (for example, buying up signals with low market value—as KCLU did with its AM in Santa Barbara—and planting translators and repeater stations all over the place), while also pioneering on the digital front. Noncommercial and religious broadcasters have both been highly resourceful and ahead of the curve on The Great Digital Shift. Re-defining regionalities. What makes a region a region, or a market a market? I think public radio is playing a role in defining both, especially as commercially-supported news becomes more partisan and less well funded by advertising. Again, my case in point is KCLU, which started as a little Thousand Oaks/Ventura station, then became a South Coast station by adding two Santa Barbara signals. Now, by adding another full-size signal in Santa Maria (KCLM/89.7), plus a translator in San Luis Obispo, KCLU is almost as much a Central Coast station, at least in terms of geographic coverage. Still, I’m not sure that’s what they have in mind. They identify now as “NPR for the California Coast,” yet their vision is still “to inform, educate and promote dialogue among the citizens of Ventura and Santa Barbara counties on local, regional, national and global issues.” No mention of San Luis Obispo County; so I’m not sure how well that’s working yet. KCBX, from San Luis Obispo, also didn’t become any less a Central Coast station when it added its South Coast signal in Santa Barbara. KCLU does talk up the Central Coast as much as it can, so maybe a shift is in the works. It’s worth nothing that Santa Barbara–Santa Maria-San Luis Obispo is a Nielsen Designated Market Area (or DMA). Ventura and Thousand Oaks are part of the Los Angeles DMA. These are determined by what local TV stations are most watched. So, while it’s an open question what defines local and regional identity, it’s clear to me that public radio is playing a serious role in that process. KCLU’s home signal from Thousand Oaks was weak and distant. So was KCRU/88.1, the Oxnard repeater for Santa Monica-based KCRW/89.9. KCRW also had a 10-watt translator on 106.9 serving Goleta (the next town west of Santa Barbara). Pacifica’s L.A. based KPFK/90.7 had a 10-watt translator on 98.7. UCSB had KCSB/91.9, its own non-NPR college station, radiating with 620 watts from Broadcast Peak, also on the Goleta side of town. There was also a local non-political full-service commercial news/talk station at the time: KEYT/1250am (now KZER), featuring a good morning show hosted by John Palminteri. In 2002, KSBX/89.5 came on the air from Gibraltar Peak. It’s a 50-watt repeater for KCBX/90.1, the public radio voice of San Luis Obispo. On the same channel, KPBS from San Diego also pounds into town on warm days. In 2005, the Santa Barbara News-Press, owned by Wendy P. McCaw, got its own local AM station, now called KZSB/1290, which has been a local old-fashioned commercial ‘full service” news station ever since. The main personality there is “Baron” Ron Herron, who has been a local radio personality for many decades. In 2008, KCLU bought a local station on the AM band. That’s now KCLU-AM/1340. Though only 650 watts, it does cover the populated South Coast pretty well. KPCC/89.3 in Pasadena/Los Angeles came on with a 10-watt Gibraltar Peak translator on 89.9. It covers the town well. Santa Monica Community College, which owns KCRW, bought KQSC from USC, and made it KDRW, which has a local studio and does some local coverage, though most of the time it’s a repeater for KCRW. A big one, too. The University of Southern California bought KDB and moved KUSC’s classical program over there from what had been KQSC (and is now KDRW). 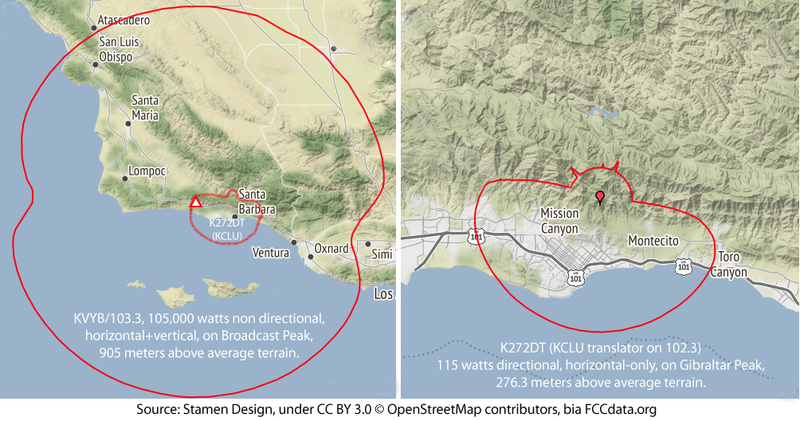 KCLU replaced its non-directional 4-watt signal on 102.3 with a new directional one that maxes at 115 watts toward downtown, but radiates as little as 5 watts in other directions. This is the signal that produces the small signal footprint in the maps above. And kills in the ratings. Along the way, local journalism flourished online as well. The Independent, a weekly, has remained a strong local institution. Edhat (founded and led by the late and still much-missed Peter Sklar) was born and became an exemplary “placeblog.” Bill MacFadyen’s Noozhawk also became a local news institution. And the News-Press didn’t die. If I had more time, I’d put all that stuff in a graphic. The latest rating period differs by market. In big markets, surveys are monthly. 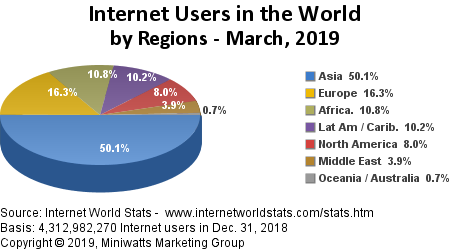 The most recent for those are February 2019. Some are quarterly, or twice annually (Spring and Fall). The most recent of those are Fall 2018 in some cases (e.g. Hudson Valley, measured quarterly, and Santa Barbara, measured Spring and Fall), and Winter 2019 in other cases (e.g. Louisville, measured quarterly). In all markets there is lots of listening to radio stations not listed in the surveys. For example, all the listed shares for New York stations totaled 88.4, while Tampa-St. Petersburg stations totaled only 24.1. That means 11.8 of New York and 75.9% of Tampa-St. Pete listening is to stations not listed in the ratings. I am sure in many markets noncommercial listening is part of that dark matter, but there’s no way to tell. In some cases, the only stations appearing in a survey are those of one or two owners. The Grand Junction survey lists only seven stations, five owned by Townsquare Media and two by Public Broadcasting of Colorado. The total of those is only 28.7. The Monroe Louisiana survey lists only six stations, all owned by Holladay Broadcasting. Those total 50.6, which means half of the listening in that market is to unlisted stations, and (presumably), ones not owned by Holladay Broadcasting. Some stations’ online streams do make survey listings in some markets. I don’t know whether Nielsen counts listeners physically located outside a market, or how Nielsen deals with smart speakers. I do know that Nielsen cares about streaming, though, because their home page says so. Okay, I’ve already said too much, and I have much more I could say. But this post has been sitting half-written in my browser since I started digging online one sleepless night in early March, so I’ll call it done enough and put it up. Digital media company Refinery29, facing a 5% revenue shortfall for the year, is cutting 10% of its workforce, or about 40 employees.Digital media company Refinery29, facing a 5% revenue shortfall for the year, is cutting 10% of its workforce, or about 40 employees. The latest cuts, first reported by the Wall Street Journal, come after New York-based Refinery29 laid off 34 employees in December 2017. Refinery29, which targets a millennial female audience, is going to cut back on content “with a short shelf life,” according to the execs. “While this type of content has been driving views, it has not yielded a great monetization strategy to justify the same level of continued investment.” Von Borries and Stefano wrote that they see sustainable growth in “premium, evergreen” programming, and plan to produce more video (both short- and long-form) on that front. As part of the restructuring, Refinery29 will also unify its sales teams into a unified Customer Solutions Group, in addition to a Sales Planning and Operations Group. This suggests that Refinery29 is becoming a high-integrity publication, and not just another content pump and eyeball-shooting gallery for adtech (tracking-based advertising). (This Digiday piece by @maxwillens may suggest the same.) If that’s so, then there is new hope: not just for publishing online, but for the kind of brand advertising that actually sponsors publications, and which has worked for both brands and publications since forever in the offline world. Advertising isn’t personal, and doesn’t have to be. 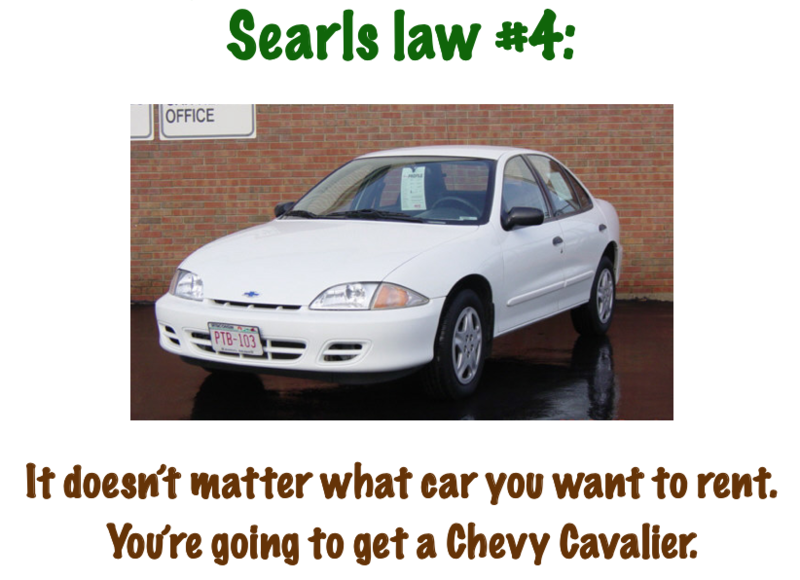 In fact, knowing it’s not personal is an advantage for advertisers. Consumers don’t wonder what the hell an ad is doing where it is, who put it there, or why. 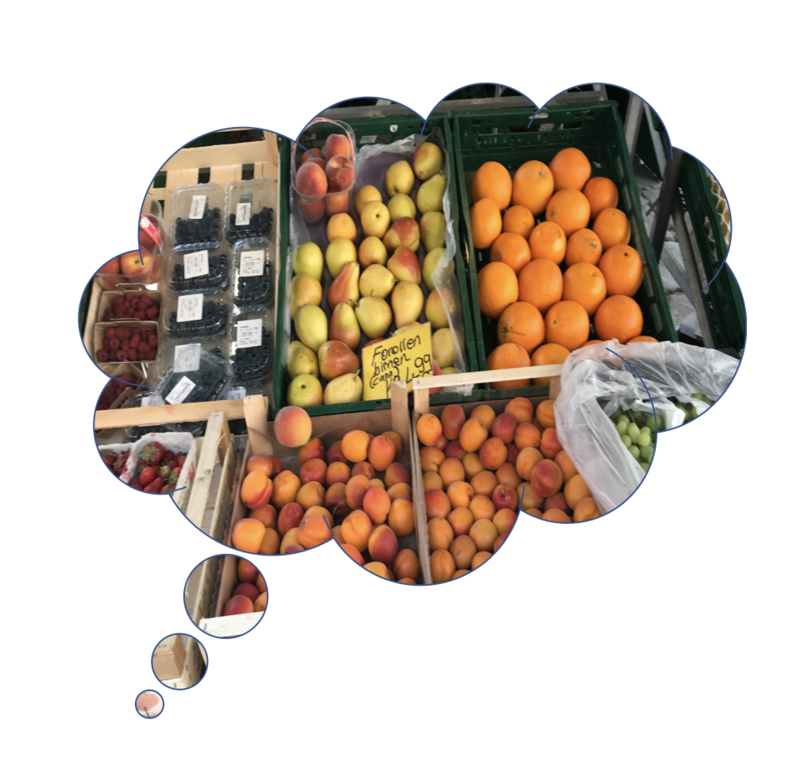 The cognitive overhead for everybody is as close to zero as possible. Advertising sponsors media, and those paid by media. All the big pro sports salaries are paid for by advertising that sponsors game broadcasts. For lack of sponsorship, media—especially publishers—are hurting. @WaltMossberg learned why on a conference stage when an ad agency guy said the agency’s ads wouldn’t sponsor Walt’s new publication, recode. Walt: “I asked him if that meant he’d be placing ads on our fledgling site. He said yes, he’d do that for a little while. And then, after the cookies he placed on Recode helped him to track our desirable audience around the web, his agency would begin removing the ads and placing them on cheaper sites our readers also happened to visit. In other words, our quality journalism was, to him, nothing more than a lead generator for target-rich readers, and would ultimately benefit sites that might care less about quality.” With friends like that, who needs enemies? Adtech spies on people and violates their privacy. By design. Never mind that you and your browser or app are anonymized. The ads are still for your eyeballs, and correlations can be made. Adtech is full of fraud and a vector for malware. @ACFou is required reading on this. Adtech incentivizes publications to prioritize “content generation” over journalism. More here and here. Adtech gives fake news a business model, because fake news is easier to produce than the real kind, and adtech will pay anybody a bounty for hauling in eyeballs. Adtech incentivizes hate speech and tribalism by giving both—and the platforms that host them—a business model too. Compared to advertising, adtech is ugly. Look up best ads of all time. One of the top results is for the American Advertising Awards. The latest winners they’ve posted are the Best in Show for 2016. Tops there is an Allstate “Interactive/Online” ad pranking a couple at a ball game. Over-exposure of their lives online leads that well-branded “Mayhem” guy to invade and trash their house. In other words, it’s a brand ad about online surveillance. Adtech has caused the largest boycott in human history. 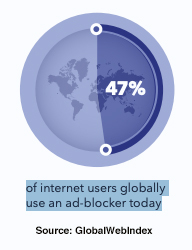 By more than a year ago, 1.7+ billion human beings were already blocking ads online. By focusing less on “content-production” (that stuff with a short shelf life) and consolidating its sales staff, Refinery29 appears to be re-making itself as a publication that can attract actual sponsors—real brands, doing real branding—and not just eyeball-hunting intermediaries that deliver lots of data and numbers to advertisers but nothing with rich value. If that’s the case, online publishing is starting to turn a corner, led by Refinery29, and heading back to what makes it valuable: to its readers, to its advertisers and to itself. Enforcing Data Protection: A Model for Risk-Based Supervision Using Responsive Regulatory Tools, a post by Dvara Research, summarizes Effective Enforcement of a Data Protection Regime, a deeply thought and researched paper by Beni Chugh (@BeniChugh), Malavika Raghavan (@teninthemorning), Nishanth Kumar (@beamboybeamboy) and Sansiddha Pani (@julupani). While it addresses proximal concerns in India, it provides useful guidance for data regulators everywhere. Any data protection regulator faces certain unique challenges. The ubiquitous collection and use of personal data by service providers in the modern economy creates a vast space for a regulator to oversee. Contraventions of a data protection regime may not immediately manifest and when they do, may not have a clear monetary or quantifiable harm. The enforcement perimeter is market-wide, so a future data protection authority will necessarily interface with other sectoral institutions. In light of these challenges, we present a model for enforcement of a data protection regime based on risk-based supervision and the use of a range of responsive enforcement tools. This forward-looking approach considers the potential for regulators to employ a range of softer tools before a breach to prevent it and after a breach to mitigate the effects. 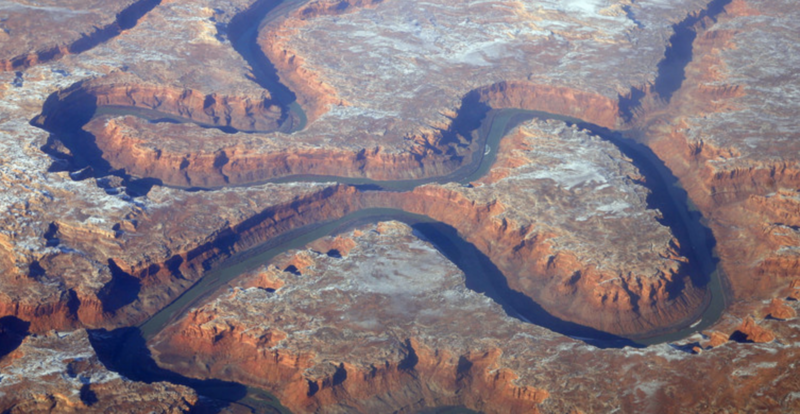 Depending on the seriousness of contraventions, the regulator can escalate up to harder enforcement actions. The departure from the focus on post-data breach sanctions (that currently dominate data protection regimes worldwide) is an attempt to consider how the regulatory community might act in coordination with entities processing data to minimise contraventions of the regime. I hope European regulators are looking at this. Because, as I said in a headline to a post last month, without enforcement, the GDPR is a fail. Bonus link from the IAPP (International Association of Privacy Professionals): When will we start seeing GDPR enforcement actions? We guess Feb. 22, 2019. And the same goes for California’s AB-375 privacy bill. The GDPR has been in force since May 25th, and it has done almost nothing to stop websites that make money from tracking-based-advertising stop participating in the tracking of readers. Instead almost all we’ve seen so far are requests for from websites to keep doing what they’re doing. Only worse. Because now when you click “Accept” under an interruptive banner saying the site’s “cookies and other technologies collect data to enhance your experience and personalize the content and advertising you see,” you’ve just consented to being spied on. And they’re covered. They can carry on with surveillance-as-usual. Score: Adtech 1, privacy 0. Or so it seems. So far. Are there any examples of publications that aren’t participating in #adtech’s spy game? Besides Linux Journal? So you can see it too, wherever you are, here’s the URL I’m redirected to on Chrome, on Firefox, on Safari and on Brave. All look the same except for Brave, which shows a blank page. 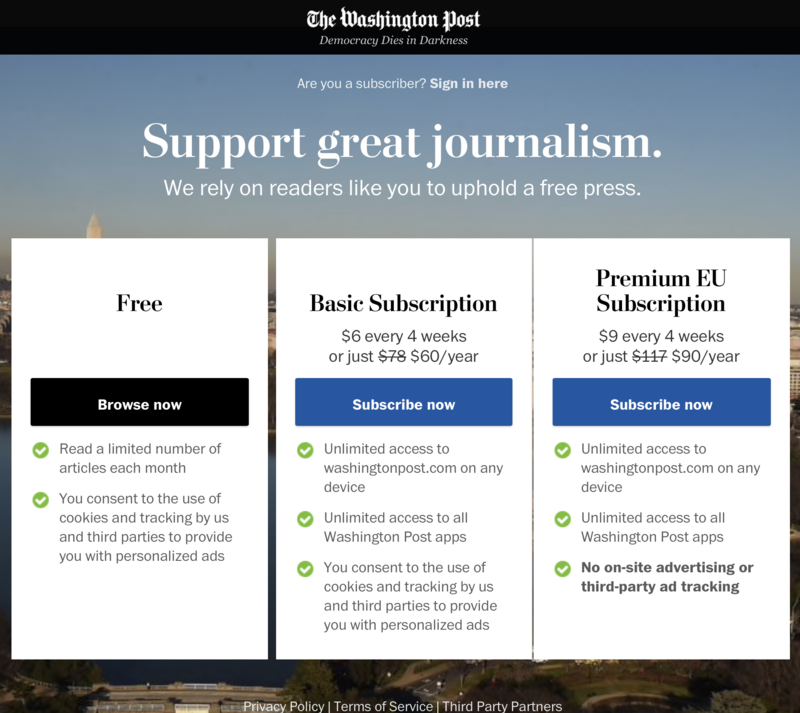 It doesn’t track readers, which is the sad and broken norm for newspapers and magazines in the online world—a norm now essentially outlawed by the GDPR, and surely the reason the Post is running this offer. It sponsors the Post. 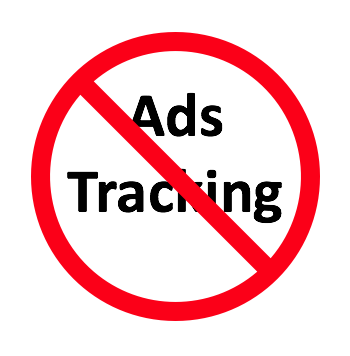 Tracking-based advertising, known in the trade as adtech, doesn’t sponsor anything. Instead it hunts down eyeballs its spyware already knows about, no matter where they go. In other words, if adtech can shoot a Washington Post reader between the eyes at the Skeevy Lake Tribune, and the Skeevy is cheaper, it might rather hit the reader over there. That’s what I get from the print edition, and that’s what I want from the online edition as well. So I want two things here. The other is to subscribe to the Post as soon as they show me they’re willing to do what I ask: give me those real ads again. 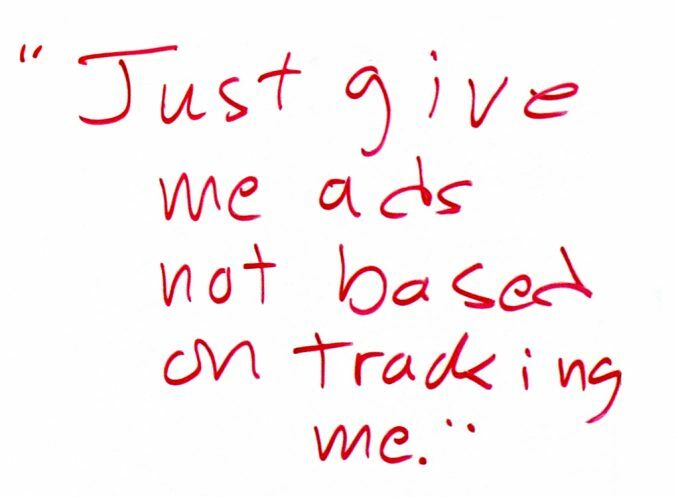 And stop assuming that all ads need to be the tracking-based kind.